There has been a lot of comment in the hedge fund industry on the asset gathering of Winton Capital this year. 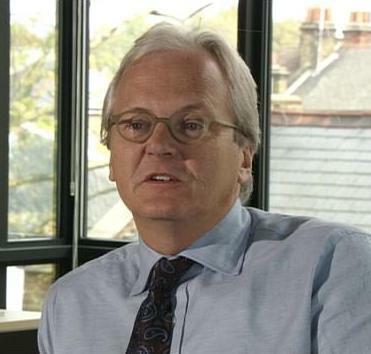 David Harding’s firm has attracted inflows of over $7bn in 2011, which equates to over 10% of the whole industry’s capital inflows. This is a remarkable market share of the growth for an industry of over 9,000 funds for investors to choose from. There has been some commentary that the success of such brand-name big managers is down to the dominance of American institutional flows to the industry, and the limited vision of the investment advisors to those funds. There has been less consideration of the investment performance of the winners. The tables below come from CM Capital Markets, a Madrid based CTA. Their fund is called CapiTrade Systematic Global Futures, and since they put together and distributed this analysis their three year old managed-account-turned-fund must stack up well on CTA performance criteria. And it does. But so does David Harding’s Winton Capital over the period covered (May 2008 to October 2011). It has been well observed that Winton scaled back risk assumption on their funds during the Credit Crunch, and that since then the funds (Futures Fund and Evolution) have been run with lower risk levels (leverage). It is therefore logical in down-years for the strategy that the Winton funds have smaller losing months and more shallow draw-downs than peer funds. But the success in producing returns this year go way beyond the conservation of capital. 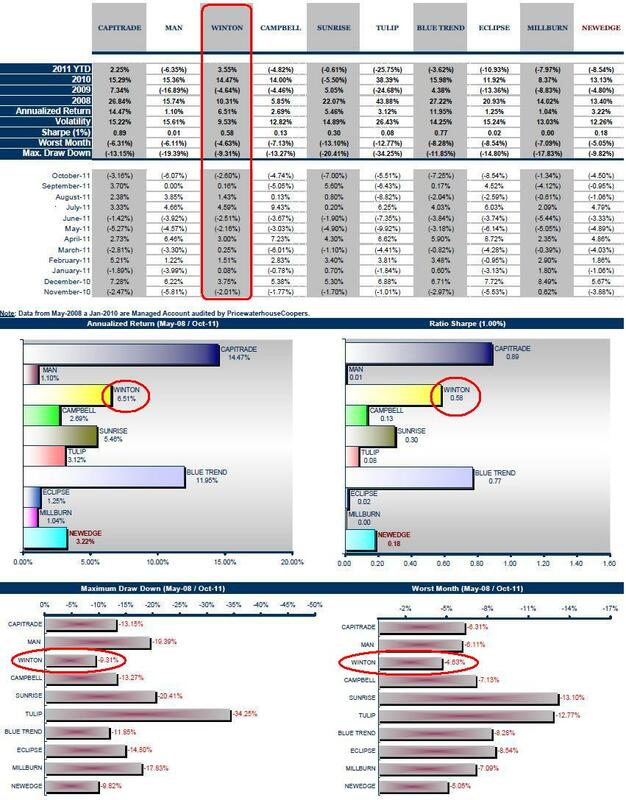 Winton Futures Fund has done better than the peer group in several ways this year: 7 out of 10 positive months (versus 3 for the Newedge CTA index), a worst-monthly-loss in that time of half of the typical loss of competitors, and a positive year to date return when most CTAs have struggled to make money. Extending the data window back to May 2008 brings BlueCrest’s BlueTrend Fund into the frame as a serious competitor on the basis of performance. Leda Braga. who runs BlueTrend, is proud to state that she has never reduced the risk appetite of the fund. This has enabled BlueTrend to produce higher absolute returns than Winton over the last 40 months, though with a higher level of volatility. If an investor is willing to take the higher volatility of return and risk assumption, then BlueTrend is a viable alternative to Winton Capital ‘s Futures Fund. But for the more conservative (by risk appetite) investor Winton Futures Fund is primus inter pares. In addition, other data quoted for Millburn in the above tables are not recognised by the Millburn Ridgefield Corporation themselves. BarclayHedge gives the annual return series for the Diversified Fund as 2008 22.36%, 2009 -7.38%, 2010 12.58% and 2011 (to Oct) as -6.75%. Apologies to the relevant managers from me for distributing erroneous data. I hope the thrust of the article still applies, and there is a lesson in this about the source of data and the (mis)use of it!